The organization's fundraising messages will feature the Democratic candidate who is challenging Sen. Susan Collins. Democrat Shenna Bellows is receiving a boost from a national pro-choice political organization in her race against Republican U.S. Sen. Susan Collins. EMILY’s List, a prominent organization that helps elect Democratic women who support protecting women’s access to abortion, plans to announce Wednesday that it has put Bellows “On the List.” The designation is not a full endorsement but means Bellows will be featured in EMILY’s List’s fundraising messages to supporters nationwide. EMILY’s List has raised more than $385 million to support female Democratic candidates since 1985 and claims more than 3 million supporters nationwide. The organization’s entrance into Maine’s Senate race could also be perceived as a swipe against Collins, a moderate Republican viewed by pro-choice groups as one of her party’s friendliest senators on the issue of reproductive rights. Collins scored an 85 percent on Planned Parenthood’s 2014 congressional scorecard of votes on key women’s health issues. EMILY’s List’s decision to highlight Maine’s U.S. Senate race could help Bellows raise money against Collins. The incumbent reported $3.6 million in her campaign coffers at the end of March compared to Bellows’ $510,000. 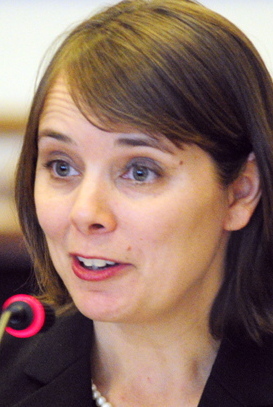 Bellows is the former executive director of the American Civil Liberties Union of Maine. Collins is considered the overwhelming favorite in the race. The Collins campaign declined to comment on the EMILY’s List announcement. Bellows said she was pleased with the group’s recognition of her campaign. Neither the statement from EMILY’s List nor that from the Bellows campaign acknowledges Collins’ reputation as a pro-choice Republican. EMILY’s List pointed out that Collins voted last week to block legislation seeking to end gender discrimination in pay, but Collins said she believes existing laws guaranteeing equal pay are adequate and that the bill could have resulted in excessive litigation.